The global contactless payment market is projected to grow at a CAGR of 24% between 2017 and 2022, this include mobile payment but of course contactless bank cards. Although the adoption rate of contactless bank cards has been quick in some countries, such as Australia, South Korea and Canada, others including the US and Japan are way behind. Trends are however showing that these countries are soon going to adopt contactless cards. Nevertheless, there is a need for innovation to drive adoption. Paragon ID, through its subsidiary Amatech, has launched the world’s first metal cards with a dual interface allowing the ability to activate contactless payment on both sides. Our EMV metal bank cards contain the world’s first inlay with a dual interface chip module and meet the high security requirements of RFID-enabled smartcards in the payment sector. The fact that the card is contactless on both sides enhances the convenience and efficiency and therefore the customer experience as a whole. Mainly aimed at wealthy customers and seen as a luxury accessory, metal bank cards are becoming more popular and accessible with new ones being launched with no fees attached. To answer the growing requirements for metal cards, we have developed a selection of construction, finishing and weight catering for a wide range of customers. These different options allow issuers of payment cards (banks, financial service providers, etc.) to offer "packaged" luxury metal cards bundled with a range of privileges and benefits personalised to their customers and their lifestyles. Our solution allows secure card manufacturers to concentrate on the personalization and fulfilment services. 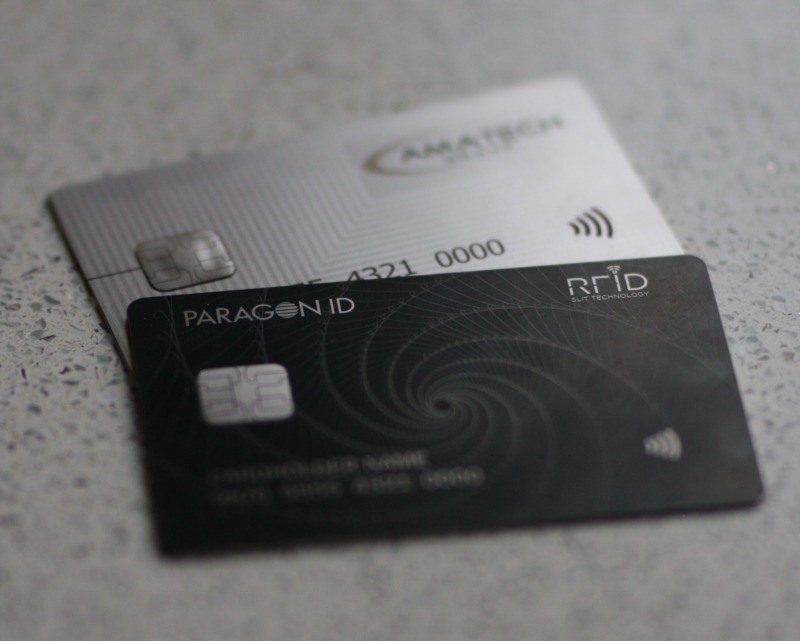 Paragon ID’s subsidiary AmaTech is a pioneer in the development of RFID applications aimed at the banking industry and its suppliers. The company’s mission is to provide best-in-class technologies and innovations to enable contactless transactions and fight fraud. The company is recognised worldwide for its technology and innovations. Interested in our secure payment solutions and our metal cards? Contact us!